Easily replace existing laser printers with the Honeywell Workstation Series. Thanks to the globally recognized PCL5e printer language, you integrate the printers into industrial environments, materials management software and SAP applications in the simplest fashion. 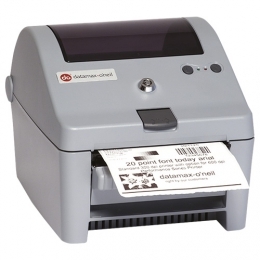 This makes the Honeywell Workstation Series truly beneficial desktop market-entry printers, particularly suitable for usage in manufacturing and retail environments, not to mention for printing delicate labels for the healthcare industry, for example, when labelling samples and medication. The Workstation printers come standard with a 300 dpi direct thermal print head, which ensures for higher print quality compared to most of the 203 dpi competitors in their class. Thanks to a print speed of up to 102 mm per second, they also produce 102 mm wide shipping labels and support speedy work processes, even in highly frequented packaging and shipping stations. Place pre-fabricated labels and graphics directly into the 32 MB Flash memory, to shorten repetitive transmission times of elaborate layouts, plus make even faster data processing possible.